Journey into the heart of Canada on a Canadian Rockies Cruisetour. From the colonial charms of British Columbia to the dramatic wilderness, alpine lakes, and snow-capped peaks of the Canadian Rockies, you’ll enjoy some of Canada’s most extraordinary destinations. Combine it with a 7-night Alaska sailing onboard the Celebrity Millennium or Celebrity Infinity for an unforgettable experience. The moment you board The Canadian, you’ll be transported back in time to the glamorous heyday of rail travel: the mid-1900s. Sit back and relax in comfort and style as you journey through some of Canada’s most beautiful destinations. By day, you’ll travel between Jasper and Vancouver and be treated to gorgeous mountain views, while overnight the train makes its way through the farmlands of British Columbia’s Fraser Valley. 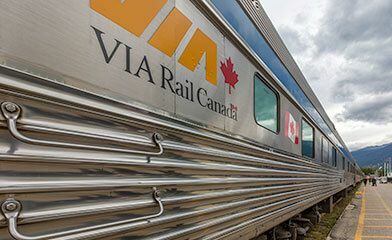 Choose a cozy berth or a cabin that sleeps one, two, three, or four passengers with VIA Rail’s Sleeper Plus Class. After a great night’s sleep, savor a freshly cooked meal in the dining car, where the menu features regional specialties and Canadian wines served alongside amazing views. Enjoy wine tastings, musical acts, lounge access, and so much more to make the most of your rail journey.